It was sometime in 1980 when I heard my first Police song. My friend Sharon’s really cool older sister played the Zenyatta Mendatta album for us. De Do Do, De Da Da Da was the first Police song I ever heard. Since I was to young and stupid to ask her to make me a copy and too poor to buy my own copy, future exposure to The Police was only through the radio. As I got a little older, I managed to have the money for both the Ghosts and the Machine album and concert. We managed to get tickets on the floor of the Mid South Coliseum in Memphis Tennessee. We were probably thirty rows back but we pushed our way forward to the front of the stage. I was inches away from Sting and his shock white hair. He could have stepped out onto my head if he had taken the notion. There were drawbacks to being in the very front. Breathing became less of an option as I was pushed into the front of the stage. I endured it as long as I could, but alas, I was a psuedo punk rocker, I could not take the pain. I gave up my spot. The next year I saw The Police at Stokely Center in Knoxville Tennessee. The seats were not nearly as good, but we where still lucky because Flock of Seagulls played before The Police and it was like getting two concerts for the price of one. HEY, don’t laugh. Flock of Seagulls did not have the cheese factor at the time as it does today. This was the Synchronicity tour and what angst ridden twenty year old couldn’t relate to King of Pain. Who knew in 1983 that it would be twenty-four years before I would ever have the chance to see them again. During this time my Police fix came from earlier albums I had not been exposed to yet, box sets, imports and of course Sting in his solo career. In the news, you would catch snippets of how the boys played together at a wedding (I think it was Stewart Copeland). Not sure if they played together at their induction into the Rock and Roll Hall of Fame. But you never heard rumors of a possible reunion. Too many artistic differences, plus Sting seemed to be touring endlessly on his own. 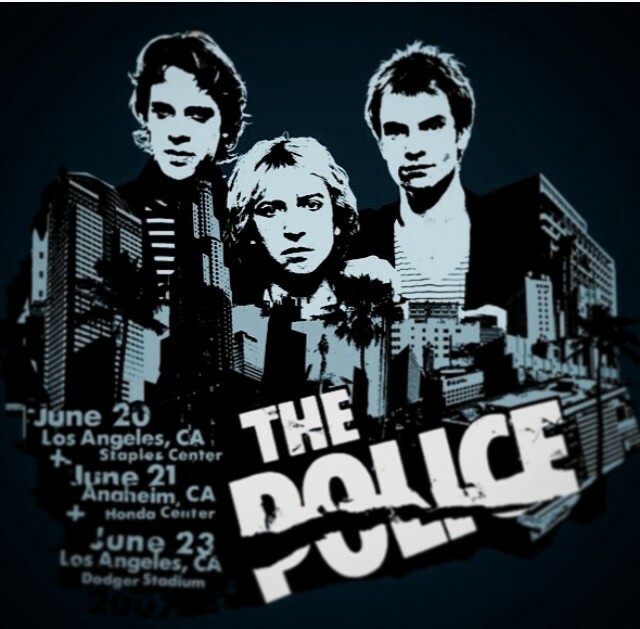 Unfortunately, my memory does not serve me on the how and why, but it was announced that The Police would be playing at Dodger Stadium in on June 23, 2007. I put out feelers to get tickets from the people I do work with. In February of this year, I felt like I won the lottery when one of those wonderful people sent me two tickets for seats on the field at Dodger Stadium. I swear I don’t know if I was more excited about seeing The Police or being on the field at Dodger Stadium. I went with my friend with Lucas. We made a deal when we were looking for tickets. He put out his feelers and the same time I put out mine. Mine came up, so he drove. We found out that the show started at 6:30 with a band called Fictional Plane(Sting’s son’s band). The second band was my chance to once again to get two for the price of one. Foo Fighters played before The Police. I never saw a band so happy to be playing at a venue. They were the perfect band to play before The Police. I love the story Lucas just told me about how Dave Grohl stated that he thinks it is ridiculous to pay a couple hundred dollars for bands playing reunion tours. Then he amended his statement by saying he would pay that money to see The Police play a reunion tour. This was the first time they ever played Dodger Stadium and they promised they would be back for six more night later that summer…okay so that was a lie. They had fun with the time they were there. Dave Grohl even came out into the audience and we were close enough to him to make our good seats, fantastic seats. But I digress, I need to paint a picture. Like said, Lucas picked me up. I live ten minutes from Dodger Stadium. We were able to take all the back roads to get there and avoided much of the really bad traffic. But as we drove up to Elysian Park, we pretty much had to inch our way into the stadium. Elysian Park happens to be the location of the Los Angeles Police Academy. So we had to pass the Police to get to The Police. Okay, corny, but kind of cute. The usual bootleggers were selling t-shirts by the side of the road. On approaching Dodger Stadium around 7:15, it was a sea of cars, the parking looked like it was going to be tedious and it was. It took about twenty minutes just to park. And by the time we were walking up to the stadium, the Foo Fighters had already started playing. We entered Dodger stadium in a place I could only describe as the back door that led to the field. Crossing the warning track was like entering Oz for the first time. White tiles were laid out on the field as far as the eye could see. Simple white folding chairs were setup on the white tiles and a temporary white fence surrounded the floor seats. It was calm and organized. Our seats were five rows back in section F23. If I had to guess, I would say that we were about thirty rows from the stage. But remember all of this is outdoors. The sounds and sights and smells that usually come from being in a closed in room did not stifle us. The bands were NEVER too loud. The noise of the people around us was not distracting. The people in the seats next to us never showed, so it wasn’t too crowded. For the sake of perspective, the stage was in the outfield of Dodger Stadium. If someone asked me where I was on the field if I happen to be playing in a baseball game. I would say I would be playing shortstop, maybe in left field. Our seats were definitely somewhere between the two. I have to say as amazing as it was to watch the bands play, a close second was turning around and having the point of view of a baseball player has when fifty-five thousand people are watching them play the game. Here is another lesson learned. Cells phones didn’t work at concerts in 2007, even if you are outside. Damn. I kept trying to call people I knew were at the concert. No luck. Getting a signal was impossible. Only texting worked, but some people have phones that didn’t get text messages. Needless to say, I was basking in appreciation of what I was experiencing. Foo Fighters played for solid hour. The music was nonstop. There was very little chatter between songs. I loved seeing these guys. I thought they rocked the house. Of course, nearsighted me had to take advantage of the huge screens to see the band. But my view was not blocked and I could also see these guys live and in color. Okay, here is the part of the picture I cannot paint. I can’t list the songs they played or in what order. I just know I was psyched by every one I heard. Let me just say, these seats were so good, I never wanted to leave them, but on the last Foo Fighters song, we walked down the isle to get closer to where the food was. That was the right decision. We didn’t have to miss the music and we still got in line early. Standing in line was another adventure. The cashier were working slowly, so to pass the time, Lucas, who is tall, surveyed the crowd, spotting celebraties, Chris Kattan with a girl way to good looking to be with him, Marisa Tomei and some girl from the OC. When we ordered, hot dogs where going to take ten minutes to cook. As I was waiting for them, this guy who was probably BORN when the band broke up asked me if I had seen The Police before. I told him my story. I didn’t have to ask him his story, but he told me this was his second time seeing them. He had seen them two weeks earlier in Denver. WHATEVER. We went back to our seats. It would be another twenty minutes before The Police started. I had mixed emotions. I couldn’t wait for it to start and I didn’t want it to start. I just wanted to sit there in my field seat forever. Among fifty five thousand of my closest friends. However, the time did finally come. The lights dim. The slight rumble of sound systems coming to life and the boys, who are boys no longer, came on stage. Sting, still looking as wiry and as healthy as ever. Andy Summers looking a little pauchier then 24 years earlier. And Stewart Copeland wearing a sweatband around the same hairstyle he had on the last tour. Except then the hair that was blond had turned gray. They started the concert with Message in a Bottle and if anyone ever asked me to describe what it is like to be transported though time. I would have to tell them it felt similar to what I felt when The Police played the first song of the concert at their reunion tour. I stood there for two hours dancing and having absolutely no concept of time or place. I kept turning around to look at all the others enjoying this as much as I was. Often, I was felt like I was hearing the band in surround. But Lucas said I was probably hearing everyone else singing. The visuals were good. Much of the light show matched the colors of The Police. Red, Blue and Yellow. I tried to take pictures with my camera phone, but failed miserably. My good camera stayed at home. I didn’t want to have to keep up with it. My memories and this essay will have to do as my way of archiving this experience. Again, I will not be able to tell you the song order, but I can tell you a good portion of what they played: De Do Do Do, De Da Da Da, Voices Inside My Head, Don’t Stand So Close to Me, Invisible Sun, Walking in Your Footsteps, Every Little Thing She Does Is Magic, Can’t Stand Losing You, Roxanne, Every Breath You Take, So Lonely, King of Pain, Wrapped Around Your Finger, Walking On The Moon. Okay, criticisms, some of the songs were jazzed up. Lucas called it Stingafied. I agree. These guys started their band to rock out. The song that was evident of that was On Any Other Day (which was not played another night and is one of my favorites). Oh well, we forgive because we know how Sting is. Now, I am not sure if it was the mix or if Andy Summers has an inferiority complex over his guitar playing abilities, but there seemed to be a few instances of issues with the lead guitar. Stewart Copeland played the drums brilliantly. Sting played the bass, but really, how hard could that be. Dude has a good voice though. On the encore, Sting played his rauchy, beat up bass that had definitely seen better days. I didn’t see this but Lucas said at the end the show, Sting would not let the roadie take that ratty guitar away. I will say, like the Foo Fighters, The Police really seemed to be enjoying the Dodger Stadium experience. The encore songs were, King of Pain, So Lonely and Every Breath You Take. I was already depressed that the concert was coming to a close, but the encore songs made me want to cry. Then, the final song, which I am so sorry to say that the name escapes me right now started and they went all out. It rocked. It was fast. It was loud. The tempo matched frenetic pace of the black and white pictures of The Police 30 years ago flashing across the screen. It was a great way to end of the show. It was over. I had to ask Lucas if it was over. He assured me it was. I swear, I walked as slow as I could out of that stadium. When I got to the dirt of the warning track, I drug my feet through, knowing full well that some fine groundskeeper will sweep my footsteps away in a matter of hours. Since we knew we would have to wait awhile to get out of the parking lot, we took a detour to the bathrooms. Well, as good as our concert experience was on the field, the bathroom experience was the exact opposite. Suddenly we were in steerage class with nothing but nasty, very used porta potties as far as the eye could see. I opted to find the ladies room and lucked out. Luckily, I found Lucas on the way out and we continued the experience by making our way through the unbearable parking at the stadium. Final assessment…Good Times!